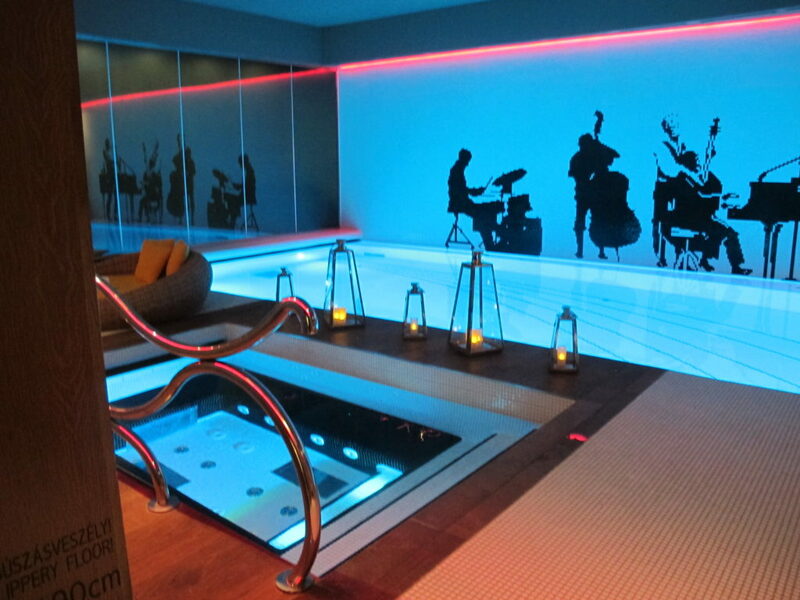 There is no mistaking the fact that Aria Hotel Budapest by the Library Hotel Collection is all about music. A fanciful piano keyboard swirls along the lobby floor from the front entrance to a real grand piano, which is played during the complimentary daily afternoon wine and cheese. Then there’s the theater, where guests can enjoy videos ranging from opera to Broadway musicals, and a music library. Here Kornél Magyar, the hotel’s official music concierge and a professional musician himself, can make reservations for one of the city’s almost daily church organ or classical music performances and tell you where the best gypsy or jazz musicians will be jamming. 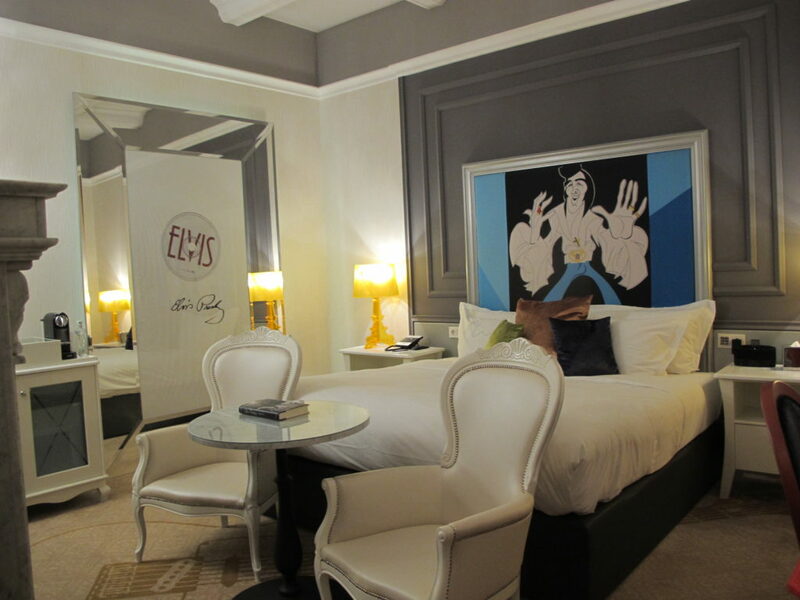 The hotel’s rooms are individually themed to musicians. Photo Geri Bain. 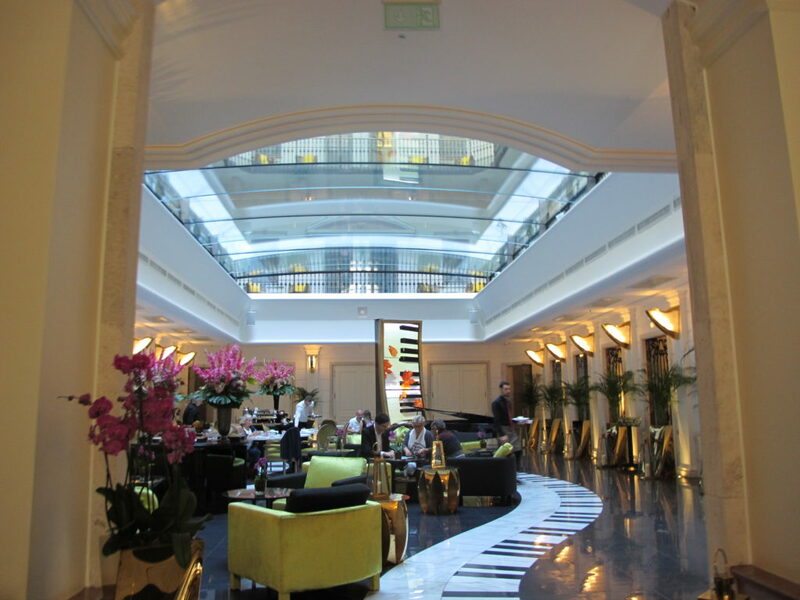 The 49-room hotel has four wings: Classical, Opera, Contemporary, and Jazz. Each room or suite is individually decorated to celebrate a different music legend, from James Brown and Bob Dylan to Hungary’s favorite son, Franz Liszt. Our bellhop showed us how to raise and lower the window blinds from a bed control and pull up the music we want on the television. We also learned that all rooms come with handy smartphones for use around the city, an unusual and appreciated amenity, as well as free Wi-Fi, and use of the gym and spa. I always feel more at home when there is food at my fingertips and I don’t have to ask anyone to bring it to me. In the room, there was a coffee maker, with tea and coffee on tap, as well as a refrigerator stocked with still and sparkling water (all complimentary). Plus, throughout the day, the music library has self-serve coffee and tea on tap along with apples or other snacks. 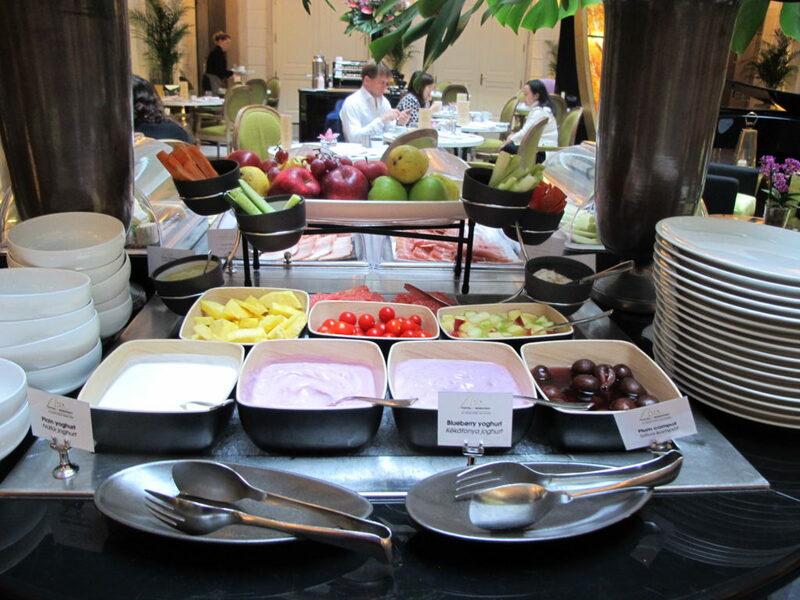 Best of all, a generous complimentary breakfast, a la carte or buffet, is served every morning in the lobby and in the Stradivari Restaurant. The pool/jacuzzi at Aria Hotel Budapest has a resort feel to it, thanks to the cabana-like tented double lounge chairs. Creative lighting complemented by (what else?!) a colorful musical theme, gives the interior space an airy feeling. After a day of sightseeing, it was lovely to return to my hotel room, put on a plush robe and take the elevator to the spa to soak in the Jacuzzi, stretch out with a few laps in the heated pool, and relax. Guests also have use of the sauna, steam bath, and workout room, and can book a variety of spa treatments. There also are yoga mats in the rooms and in-room videos on demand. For a small hotel, Aria offers a surprising array of choices for bars and dining, all of which draw locals as well as hotel guests. 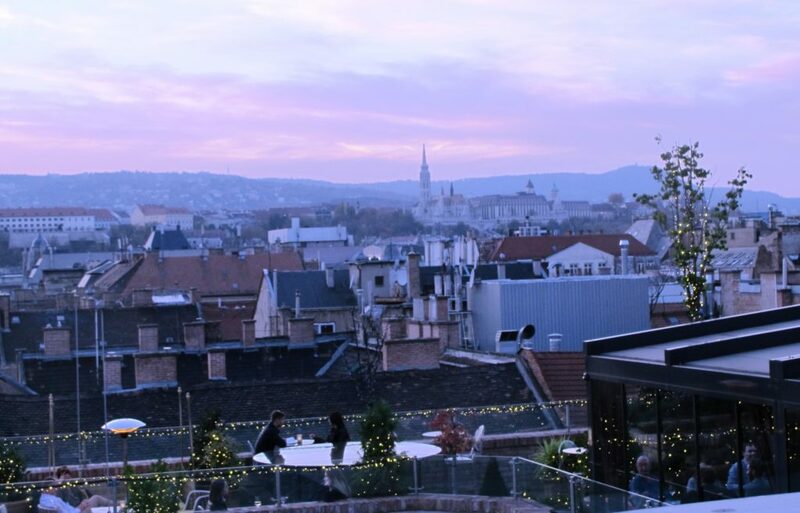 My favorite was the High Note SkyBar, which affords incredible views of the city. During the summer, there are also tables set atop elevated seating areas that put you on eye-level with the cupola of St. Stephen’s Basilica. In addition, Stradivari Restaurant serves great farm-to-table Hungarian-inspired lunches and dinners, while the more casual Satchmo’s has a fireplace in winter and al fresco dining on a garden terrace in warm weather. If you go, check out the famous artists who have their names etched into the mirrors, including Placido Domingo and Will Smith. 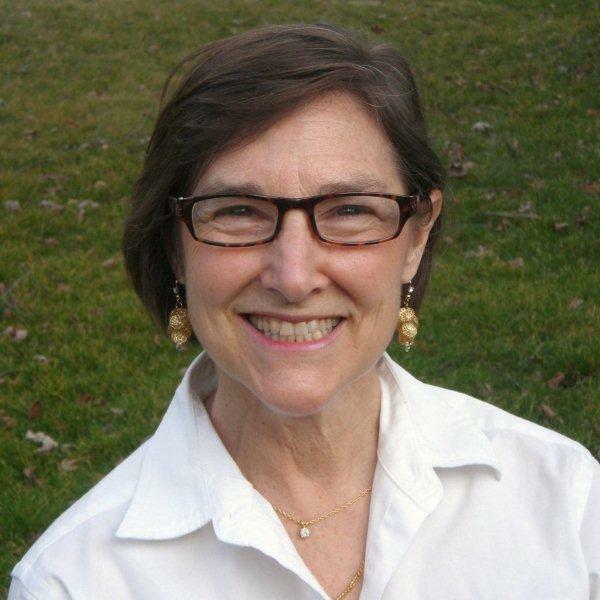 Geri Bain is the co-author of The Complete Guide to Vow Renewals, an ebook released in December 2018. She has written about more than 60 countries and contributed to publications including inc.com, about.com, N.Y. Daily News and Robb Report. While travel editor at Modern Bride magazine, she wrote an acclaimed guide to Honeymoons and Weddings Away. She is a past president of the New York Travel Writers Association and former editorial director of Endless Vacation magazine. The Aria Hotel has a grand piano in the lobby and a music concierge.